You will find The Granary in Shawlands, Glasgow. Step in to discover a traditional pub of unique character, revered for its eclectic range of real ales and its quality pub food, which are served, as they should be, with a generous measure of famous British hospitality. The Granary was historically a hub for tram cars until 1962. Our walls are still adorned with the metal rosettes that carried the electric cables that powered the trams. Nearby is Queen’s Park, the oldest park on the south side of the city, and the imposing Langside Halls. 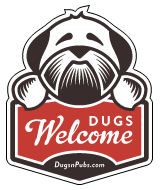 We welcome you and your doggy companion into our front bar area. Please note that unfortunately dogs are not allowed in the restaurant area (children are only allowed in the restaurant).